Rosenthal, a Hampshire founder and former trustee, was president of non-profit organization Seeing Eye, Inc.
President Miriam Nelson resigned from Hampshire College effective Friday, April 5, 2019, at 4:00 pm, having submitted her resignation letter to the Board two days earlier. 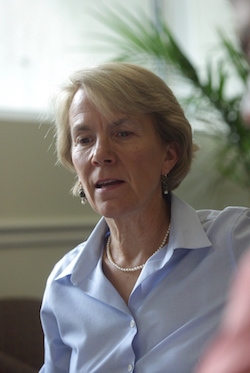 In a letter to the Hampshire community today, Nelson said the College is divided over her leadership and she had become a distraction from the College’s important work to establish a sustainable financial model. She expressed optimism that the Board, working closely with the Hampshire community, will overcome its persistent financial challenges. “I am confident a new leader will work within a more favorable environment and find a path to daylight that has eluded me,” Nelson wrote in a letter to campus this afternoon. “In a short period of time, I have come to love Hampshire, and to deeply admire the students, staff, faculty, alums, and friends whom I have had the great pleasure of getting to know.” She concluded, “I leave knowing that if there is any community that can creatively surmount obstacles, it is Hampshire.” Read her letter here. Over the past five years, Hampshire has faced a 20% decline in enrollment and resulting operating deficits, balancing its budgets by reducing staff and receiving major rescue gifts from trustees and a one-time endowment investment dividend. After President Nelson began her tenure in July, she and the Board worked through the fall semester to assess the College’s resources and ability to reverse a projected deficit of more than $5 million for next year (2019-20), and a projected cumulative deficit of close to $20 million over the subsequent three years. Dependent on tuition for 87% of its revenues, Hampshire has a small endowment of $52 million. These realities raised the risk that the College would not be able to educate an incoming fall class through to graduation, which led the Board to vote to focus on educating its current students and not admit a full new class until they establish a sustainable business model. Through the fall, Nelson and trustees met with groups of alumni, and individually with major donors, as they explored the feasibility of a major fundraising effort at the level required to sustain Hampshire. With the Board’s authorization, Nelson in late fall also began pursuing the option of partnerships for the College, publicly announcing a search on January 15, which led to talks with more potential partners. The announcement caused distress and criticism from some constituents, and the Board and Nelson sought the past two months to work more closely with the community on exploring options for Hampshire to remain independent. Board Chair Gaye Hill announced her resignation on Monday, April 1. The majority of Hampshire’s trustees are alumni or parents of the College committed to its mission and long-term success, and they responded swiftly today by appointing a new interim president and interim Board chair. Nelson had been selected as Hampshire’s seventh president in April 2018, by the Board of Trustees after receiving a formal recommendation from a presidential search committee comprised of faculty, students, staff, and trustees, following an extensive, yearlong national search. The Board of Trustees met today at noon and voted to appoint Ken Rosenthal as interim president. 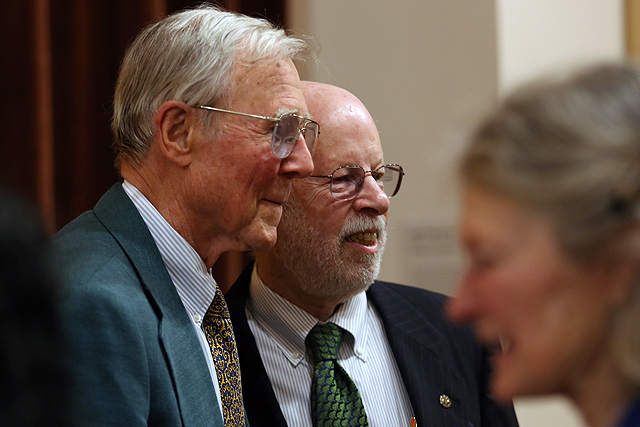 Rosenthal was one of the College’s founders and its fifth employee, hired in 1966, and its first treasurer. He left the Hampshire administration in 1976 for a long career in law, business, and the nonprofit sector, ultimately retiring as president of the non-profit The Seeing Eye, the world’s premier guide-dog school for the blind. During his tenure there, the organization’s net assets increased by 70 percent. He returned to Hampshire to serve as a trustee from 2008 to 2016 after his daughter graduated from the College. As a trustee, he served in numerous governance and committee capacities, including as one of the core members of the Presidential Search Committee that appointed Jonathan Lash. When Rosenthal retired as trustee in 2016, he established an endowment to fund faculty research. He continues to serve on numerous boards, including the Better Angels Society, a foundation that supports the films of Hampshire alum Ken Burns. Rosenthal said he will begin immediately to work with College leaders to address the uncertainties faced by Hampshire’s current students and their parents, faculty and staff, and its small class of incoming students. He said he’s committed to channeling the passion and commitment of the Hampshire community to finding a long-term solution. Today the Board of Trustees also appointed a new interim chair, Luis Hernandez 70F, and voted to lead a fundraising campaign to keep Hampshire independent, which will dictate his priorities for the College in the coming weeks and months. Hernandez became chair on Monday, April 1, following Gaye Hill’s resignation as specified in the bylaws, and the vote today by trustees affirmed their confidence in his leadership. After graduating from Hampshire, Hernandez earned a master’s degree in bilingual and multicultural education from the University of San Francisco. He began his career working as a teacher, then developed educational programs for children and professional-development curricula for Head Start teachers across the country. Today, he’s an early childhood education specialist who provides training and technical assistance through Western Kentucky University. His expertise encompasses early literacy, dual-language learning, adult-learning practices, and diversity. A regular presenter and keynote speaker at conferences, Hernandez has served on advisory boards for a host of educational organizations, such as the United Way’s Center for Excellence in Early Childhood, the National Association of Child Care Resource and Referral Agencies, the National Association for the Education of Young Children, and the National Latino Children’s Institute. About President Nelson, Hernandez said, “Mim has served the College honorably and well, and I am dismayed by what she has had to endure. What Mim tried to do was emphasize that Hampshire’s long-term viability is an existential question, and I hope we can now move toward actually addressing that issue together.” Hernandez added, about the appointment of Ken Rosenthal, “There is no one better to help bridge this transition.” Read Luis Hernandez's letter here.